My husband and I are folding clothes on a Sunday night. Bless him for helping me tackle the mountain of wrinkled shirts and pants. Not to mention that we were running out of underwear. And bless him for not blaming me for letting the laundry get so out of control; I blame myself enough for the two of us. It’s all bound up in my underlying confusion with regard to work and child rearing. What prompted me to think about whether I’m actually in or out of the workforce is a recent cover story in the New York Times Magazine by Judith Warner on women who opted out of working outside the home in the late 1990s and early 2000s. Mostly these women—and it’s a very select group—left lucrative jobs to stay home and raise children. I mention that the group Warner’s research is based on is select because, for the most part, these women are well off and well educated. The majority of them are white and live in affluent neighborhoods. Her article doesn’t touch on women for whom staying at home was an economic sacrifice—women whose net pay would appreciably shrink when childcare became a line item in the budget. As far as I could tell the women in Warner’s article did not significantly alter their lifestyle when they initially left the workforce. But they had measured their worth by their paychecks and ten or fifteen years out, they were unable to assess that worth without a dollar sign in front of it. I suspect that my situation is more typical of the women who opted out of the formal workforce. I can pinpoint the exact moment I knew that I would stay home with my kids while they were babies. My first-born was a couple of months old and we had had a difficult, colicky night. I was up every couple of hours with her. After her five A.M. feeding I brought her into bed and we fell asleep until nine in the morning. That’s when I knew that I didn’t have the fortitude or the organizational skills to balance a job outside the home with new motherhood. I’m in awe of women who have done both. I know it’s not easy. I know it’s not magic. But I also knew I wasn’t a 24/7 type of mother. I wanted to write. And so I began to freelance with an eye toward going back to work when my children were in school all day. When they were, I went back part-time as an Internet magazine editor until I was laid off. That was ten years ago. At the time, my husband and I decided that it didn’t make economic sense for me to pursue full-time employment. He was able to support us and our version of luxury was having me at the ready for our children. I became a full-time writer seven years ago. My income is not that significant. But working from home or the library, I’m always around even if mountains of unfolded laundry surround me. I’m working on a book that may or may not get published, but my husband understands that I’m driven to do it if only for the accomplishment of telling my family story. Raising children is an art, a soul-giving endeavor. Housework is drudgery. These high-flying husbands didn’t appreciate that cleaning was their responsibility too and if they didn’t like it they should hire a house cleaner. The advice I would give my daughter is not whether or not she should opt-out and then back in when she has children. It’s to marry a partner who will fold clothes with her while watching reruns on a Sunday night with nary a complaint. I’ve been dreaming about you for a long time. I’ve already conjured you with a heady mix of my imagination, my heart and my soul where you are the perfect mate for my child. A romantic like me might say you complete my child, but the truth is my daughter and son were whole and perfect from the day they were born. I’ll admit that I’m a little jealous of you. You will know my child like no other person in the world. And you will take my place as the primary person in her life. It’s hard to cede that top spot to you even if it is right and natural. But if all goes well I won’t be giving my child away so much as gaining another child. Let’s face it: initially you and I are solely bound to each other through my daughter or son. I pray that I will be gracious and wise enough to welcome you into my life as if you were my own. It has always amazed me that two people can come together and make a family from love and optimism and grit. No matter how much you think you and your beloved have in common, you are two distinct and different people. It’s the ensuing friction and magnetism that makes marriage so challenging and compelling. Before I go on, I need to make it perfectly clear that if you ever hurt my child, you will have to answer to me. I don’t care how old he is. As long as there is blood coursing through my veins and breath powering my lungs, I will be fiercely protective of my child. I know this sounds like bravado. It’s not. I recognize that I will sometimes disagree with you as well as witness you and my child having a row or two. I won’t step in; it’s not my place. But if I ever see you truly hurting my kid physically or emotionally, nothing will stop me from coming to her aid. I also need to tell you that I hope you are Jewish. I will respect my child’s decision to marry anyone that he loves. I won’t stand in the way if you are not a Jew. However, if I’m completely honest with myself, I have to admit that if you are not Jewish a part of me will be disappointed. Judaism’s values and the paths it forges for us in the world have shaped our lives for the better. I hope Judaism will do that for you too and that you will bring up my grandchildren as Jews. This is not to say that I won’t grow to love you as much as I would my child’s Jewish partner. Notice that I used the word “grow” to describe our relationship. Any in-law relationship has to put down roots. Let me also make it perfectly clear that being Jewish won’t instantly endear me to you. More than anything, there are practical considerations for choosing a Jewish partner. In my mind, Jews share a unique vocabulary and set of feelings with one another. I love the fact that I can go to any synagogue in the world and follow the service in Hebrew. To me, that’s a grand metaphor that speaks volumes about marrying a fellow Jew. 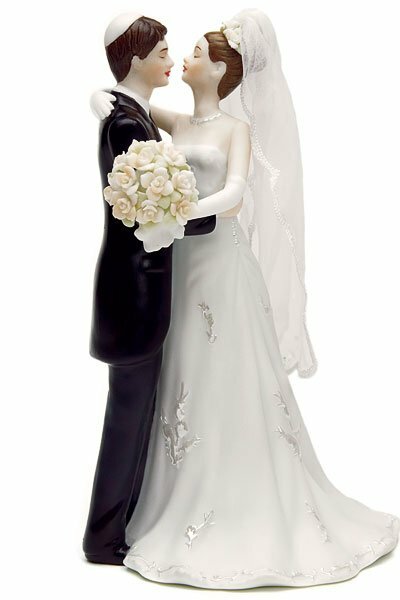 Marriage is hard enough without adding a different religion to the mix. I also have to confess to you that I spent a lot of blood, sweat and tears to give my children a Jewish education. Both of them went to day school. I can’t say that either of my teenage children is traditionally religious. But their hearts and souls are Jewish. This is not an empirical point. I’m just a mother who knows her children. And I’m a wiser adult who once thought that marrying a Jewish partner was secondary to love. I suppose that in some cases it is. All I’m saying is that marrying a Jew will more likely give me Jewish grandchildren. I can see where you might misinterpret my desire for a Jewish child-in-law as bigoted. I promise you that it’s not. My wish for Jewish grandchildren is as much demographic as it is spiritual. We Jews are a vocal yet tiny minority in this world. We can’t afford to lose whatever little ground we cover. Having said that, I’ve told my children early and often that I love them unconditionally. Unconditional love, though, does not necessarily equate with happiness. It simply means that I’m committed to my children for life and, by association, to you as well. When each of my children became a bat and bar mitzvah, the rabbi’s charge included a blessing that Ken and I have the joy of escorting our children to the huppah—the marriage canopy. I look forward to that day. And I look forward to meeting you, new child of mine. With the rise of the digital age, and parents caught between raising children and trying to help their own parents, best-selling author and New York Times columnist on contemporary families Bruce Feiler decided that it was time to write a new playbook for the 21st century family. 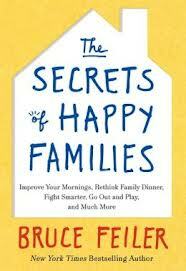 The Secrets of Happy Families: Improve Your Mornings, Rethink Family Dinner, Fight Smarter, Go Out and Play, and Much More brings together Feiler’s personal experiences as the father of young twin girls with his skills as an investigative reporter to find new sources and innovative ways to strengthen family ties. Feiler has his work cut out for him. A few years ago New York Magazine published a story, which exposed parenting as one of the least happy experiences in life. The reaction was both outrage and empathy. Was bringing up children really making us miserable? Feiler counters that assumption with a 2010 Pew Study that found that three-quarters of adults said that family was the most important part of their lives. That same 75 percent further claimed to be very satisfied with their home life and 80 percent of the respondents said that they were closer to their family today than their family of origin. So what’s going on? Are we really happier in the midst of parenting wars where tiger moms are duking it out with more lax French mothers? Feiler credits some of our happiness to positive psychology, the basis of the trendy happiness movement. But Feiler is anything but trendy. His research is solid, his findings sensible. And he has forever endeared himself to me by not mentioning Gretchen Rubin’s The Happiness Project. According to Feiler, like successful businesses successful families have the ability to adapt. In Silicon Valley, Feiler explored a concept called “agile development.” He describes it as “a system of group dynamics in which workers are organized into small teams, each team huddles briefly every morning to review progress, and the team convenes for a longer gathering at week’s end to critique how it’s functioning and make changes for the future.” Within a family, agile development can translate into a weekly family meeting in which each member discusses what went well that week, what could be improved, and what he would commit to work on for the week to come. The family meeting is not only a natural outlet for communication; it leads to other healthy activities like eating dinner together. I firmly believe in the salutary effects of the family dinner. I’ll risk repeating well-known research about eating together because I think the facts are so critical to reiterate for families with children still at home. Children who eat with their families are less likely to drink, smoke, do drugs, get pregnant, commit suicide and develop eating disorders. Yet according to UNICEF, Americans still rank 23 out of 25 when it came to teenagers eating dinner with their parents at least a few times a week. That’s a missed opportunity because dinners create perfect conditions to talk to one another. Dinners are also the ideal setting in which to develop resilience in children of all ages by sharing stories about parents and grandparents. Can’t have dinner together? Then gather for breakfast or dessert. One of my favorite sections of Feiler’s book, was about “cultivating a strong intergenerational self” in children. Children should know that they are a part of a larger family continuum. If they know they come from somewhere, they are more likely to know where they are heading in life, which brings me to the chapter on grandparents. As Feiler notes, countless studies have shown the extraordinary influence that grandparents, particularly grandmothers, have on their families. Even infrequent visits from grandparents can increase the chances of a child having a healthier relationship with her parents. A grandmother’s support reduces stress and exhaustion in a family. Finally, just when I thought I had heard everything there was to say about fighting fairly in families, I learned a few new things. It’s a given that how you fight is important to resolving conflict, but I picked up a few pointers such as monitoring pronouns. For example, using “I and we” during an argument suggests togetherness versus the accusatory “you.” Feiler encourages not only listening to someone else’s side of the story, but also being genuinely curious about their version of events. A “he said, she said” argument should segue into a third story created together by the opposing parties. That’s a precursor to compromise. There are other takeaways in The Secrets of Happy Families. Feiler looked to Warren Buffet’s banker for advice on allowances, the Green Berets for planning the perfect family reunion and successful coaches for team building. Yet throughout this entertaining and informative book, Feiler’s message is imbedded in three crucial rules that transcend time and place: Adapt all the time, talk a lot, and yes, go out and play. 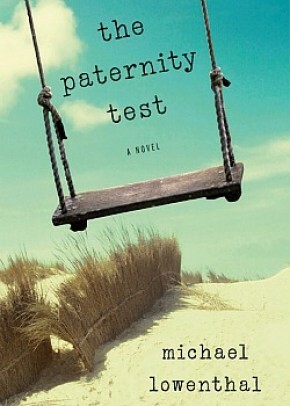 Michael Lowenthal’s fourth novel, [“The Paternity Test,”](http://lowenthal.etherweave.com/) is a beautifully told story that brings myriad social issues to the forefront, and also manages to be a literary page-turner. Lowenthal’s work is hard to categorize. His first book, [“The Same Embrace,”](http://lowenthal.etherweave.com/the-same-embrace.html told the story of identical twins, one of whom became gay while the other became an Orthodox Jew. [“Avoidance”](http://lowenthal.etherweave.com/avoidance.html) explored the cloistered worlds of the Amish and the protagonist’s long-ago summer boys’ camp. [“Charity Girl”](http://lowenthal.etherweave.com/charity-girl.html) took up a little-known chapter of American history when women were incarcerated during the First World War in a government effort to contain venereal disease. Versatility is a hallmark of Lowenthal’s work, as is the 43-year-old writer’s gift for language and depth of character. “The Paternity Test” gracefully merges gay marriage, Jewish identity, sexuality, the Holocaust, Jewish continuity and sexual fidelity in one story. The issue of Jewish continuity following the Holocaust further complicates the story. Stu’s sister, Rina, recently married Richard, a nice Jewish boy, but she cannot conceive. Meanwhile, Stu also feels the pressure of passing on the Nadler genes. I was raised in a [Conservative] Jewish household, and three of my four novels prominently feature Jewish characters and Judaism-related plot elements, so yes, obviously, I’m a Jewish writer. I’m reminded of a remark by a gay writer when he was asked if there is such a thing as a gay sensibility, and, if so, what effect it has on the arts. He said, ‘No, there is no such thing as a gay sensibility, and yes, it has an immense impact on the arts.’ Maybe the same thing could be said of Jewish sensibility? Stu and Pat’s search for a surrogate begins, as does an intense exploration of Jewish identity. After visiting various agencies and trolling surrogate sites on the Internet, they settle on Debora Cardozo Neuman. In Stu Nadler’s surprisingly traditional mindset, Jewish babies must be born to Jewish mothers and Debora fits the bill, albeit in an unusual way. A native of Brazil, she comes from a *converso*background — generations before her, Jews practiced Catholicism outwardly yet clung to their Judaism. Now Deborah follows a set of quirky habits and mysterious dietary restrictions until the community uncovers its Jewish roots. A *mamzer* is a child considered to be illegitimate if born to a woman who has conceived a child outside of her marriage. Like the plight of the *aguna* — a woman who is legally stranded in a marriage because a husband refuses to grant her a Jewish divorce or a *get* — *mamzerim* have no control over their fate or their standing in the community. While liberal branches of Judaism have done away with the *mamzer*status, Richard adheres to ultra-Orthodox tradition and in the process destroys his marriage. Place is also important to Lowenthal. Pat and Stu relocate to a house on Cape Cod very similar to the one in which Lowenthal spent his summers. His Portuguese sounds flawless to this Spanish speaker’s ear as I ask him about the word *saudade* — a word that Debora uses when describing Pat and Stu’s need for a child. There’s no question that a feeling of *saudade* permeates “The Paternity Test.”Each character has his or her own *saudade* in longing for a baby. And their complex desires irrevocably change life for Stu, Pat and Debora in ways they could never imagine. Here, in a nutshell, are the principles of economic empowerment handed down to me from the women in my mother’s family: Your money is your money. Your husband’s money is your money. All the money in the house and the bank is your money. A man only needs enough money in his pocket to buy a snack or, if he must, a lunch. Imagine my surprise, and yes, even some guilt, when I recently learned that I’d been committing financial infidelity for years. My husband Ken doesn’t believe that all of our money is mine to control. Worse, Ken rarely buys anything for himself. For example, he put an iPod purchase on hold indefinitely until I gave him the darn thing for his birthday. Since I barely make enough money to merit a W2, it might appear that Ken bought the iPod for himself anyway. But in my paradigm of financial independence, appearances are often deceiving. There’s no question that I was the generous giver here. Financial infidelity is virtually impossible to pull off without a trusting partner. But some perspective please: it’s not like I’m hiding a Swiss bank account. Ultimately, though, I’ve breached my husband’s monetary trust. If you ask Ken he’ll say the only way to make it up to him is to stop buying things I don’t need. He’s right of course, but it’s not that simple. Our standards about what I need often wildly diverge. When my children were little they liked a song with tongue-in-cheek lyrics that went something like this: “Look left, look right—everything you see is mine.” As the self-appointed chief executive officer of my busy family of four, that pretty much sums up the perks I’ve awarded myself. For example, after Ken dawdled for months about upgrading our television sets for the 21st century, I finally left the house one Saturday morning and became the proud owner of a forty-inch high definition TV. I announced to my stunned family that our new cable-ready addition was waiting to be unloaded and hooked up. It was apparent from the hurt look on my husband’s face that I had committed an indiscretion. “I thought we were going to pick out a television together,” he said. “You had almost a year,” I shot back. “But this is a major purchase,” he complained. My husband’s procrastination with regard to purchases (he’d argue it’s economic prudence) has an upside. It gives me the opportunity to jump in and do what I have to do making me, so far, the proud owner of a GPS, an iPad and another high-def TV for our bedroom. Financial infidelity? I call it reasonable upgrading. Growing up my parents fought a lot about money—how Dad should earn more so Mom could spend more—an old-fashioned corollary to my mother’s mantras of economic empowerment. I’d go along on revenge shopping trips with my mother to Lord & Taylor where everything was bathed in gold light. I’ll never forget how beautiful my mother looked in her new gray suit with the military jacket and the killer boots she bought to go with it. All the money in the house was hers and she meant it. The day she went back to teaching full-time was the day she opened up her own checking account. I’ve never thought of myself as financially unfaithful because of my own relatively harmless shopping habit. But there’s been a lot of talk in the media lately about financial infidelity. Suddenly I recognized the blood boiling, heart-racing telltale symptoms of my inner financial philanderer. Since I could never be as openly brazen as my mother, top on the list of can’t-miss signs was leaving purchases in the trunk of my car until the coast was clear. In other words—no witnesses. Another sign. Nine times out of ten I will carefully integrate a new piece of clothing or a pair of shoes into my wardrobe. I make it easier on myself by not buying two-toned platform leather boots, stunning as they were back in the day. Camouflaging a new handbag—my Achilles heel—is trickier, especially if it’s a tote or it’s not black. Like most illicit affairs, my days of overt financial infidelity are winding down. 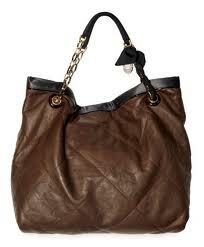 My daughter is in college and I just sent back that designer bag I bought on whim, on-line, at two in the morning. But it seems that once you’re a shopping philanderer, you’ll always be a shopping philanderer. I’m sure there will be the errant purchase here and there—something on sale just begging to be bought. What else could I wear to my uncle’s recent surprise 70th birthday party but a vest with tulle skirting attached? Reduced from $900 to $200. Just one left, lo and behold, in my size. (I’m wondering who bought the other pieces for almost a thousand dollars. I think, I know. Someone who’s finished paying tuition). There’s a concrete bottom-line here: All the money in the house was my money. Now it’s being forked over for tuition in the foreseeable future. But I bet I’ll find a way to continue to sneak in chocolate and that pair of shoes that was wondrously reduced just for me.